LVB Probationary Officer Result Check Here. LVB Probationary Officer Training Admit Card / Call Letter Check Here. LVB Probationary Officer GD / Interivew Admit Card Check Here. LVB Probationary Officer Admit Card Check Here. LVB Notification is out. 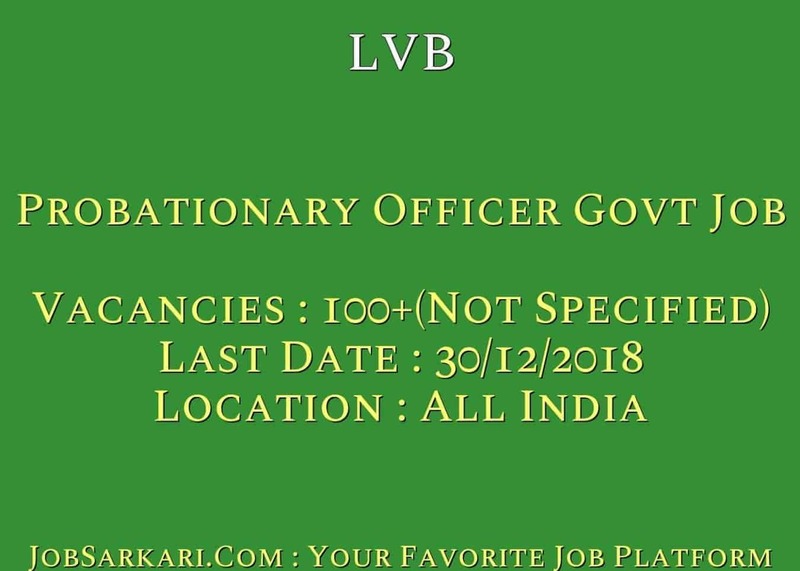 LVB is recruiting for 100+(Not Specified) Probationary Officer Govt Job 2019 Posts. You can check LVB - Lakshmi Vilas Bank last date, download LVB notification, visit LVB official website and check other LVB Vacancy details.Complete Vacancy and recruitment Details about 100+(Not Specified) Probationary Officer Govt Job 2019 vacancies in LVB are provided below by JobSarkari.Com only for you. Last Date for Apply Online 30/12/2018. Last Date for Payment of Exam Fee 30/12/2018. Date of CBT Examination 20/01/2019. Candidate Must Have Passed Graduation With 60% Marks. 100+(Not Specified). Candidate Born Between 02/12/1990 to 01/12/1998. Computer Awareness / Digital Awareness 10. 7.Online Application Can be Submitted on or Before 30th December 2018. Q. What is the Last Date For LVB Probationary Officer Govt Job 2019 Vacancy ? A. 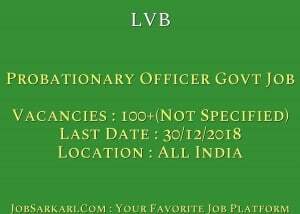 Last Date for LVB Probationary Officer Govt Job 2019 Posts is 30/12/2018. Q. What is the Form Type of LVB Probationary Officer Govt Job 2019 Recruitment ? A. The Form Type for LVB Probationary Officer Govt Job 2019 Posts is Online. Q. How many vacancies are available in Lakshmi Vilas Bank Probationary Officer Govt Job 2019 Posts ? A. There are about 100+(Not Specified) Vacancies in Lakshmi Vilas Bank Probationary Officer Govt Job 2019 Posts. Q. What is the Full Form of LVB ? A. Full Form of LVB is Lakshmi Vilas Bank .